Our Milky Way belongs to a large gathering of galaxies known as the Local Group and, along with the Andromeda and Triangulum galaxies – also referred to as M31 and M33, respectively – makes up the majority of the group's mass. "We needed to explore the galaxies' motions in 3D to uncover how they have grown and evolved, and what creates and influences their features and behaviour," says lead author Roeland van der Marel of the Space Telescope Science Institute in Baltimore, USA. "While Gaia primarily aims to study the Milky Way, it's powerful enough to spot especially massive and bright stars within nearby star-forming regions – even in galaxies beyond our own." 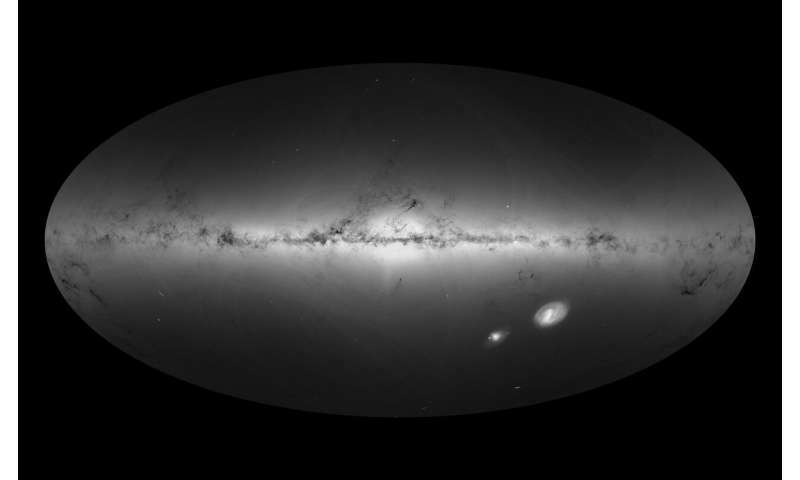 "It took an observatory as advanced as Gaia to finally do so," says Roeland. "For the first time, we've measured how M31 and M33 rotate on the sky. Astronomers used to see galaxies as clustered worlds that couldn't possibly be separate 'islands', but we now know otherwise. 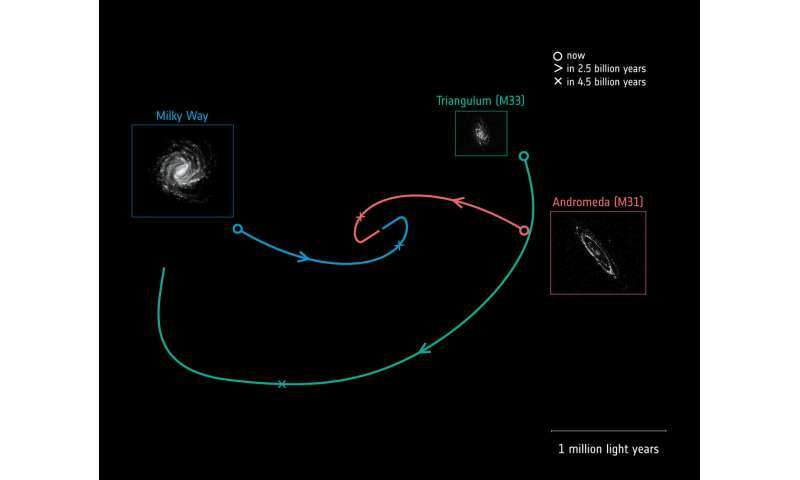 As Andromeda's motion differs somewhat from previous estimates, the galaxy is likely to deliver more of a glancing blow to the Milky Way than a head-on collision. This will take place not in 3.9 billion years' time, but in 4.5 billion – some 600 million years later than anticipated. 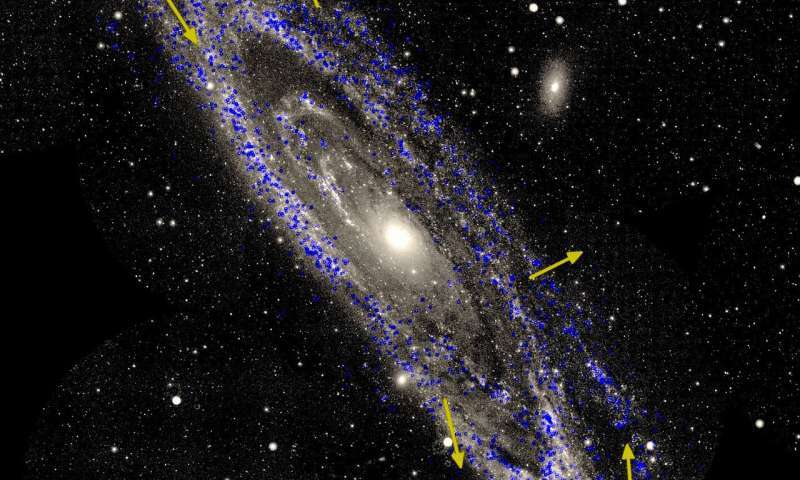 "We see unusual features in both M31 and M33, such as warped streams and tails of gas and stars. If the galaxies haven't come together before, these can't have been created by the forces felt during a merger. Perhaps they formed via interactions with other galaxies, or by gas dynamics within the galaxies themselves. "Gaia was designed primarily for mapping stars within the Milky Way—but this new study shows that the satellite is exceeding expectations, and can provide unique insights into the structure and dynamics of galaxies beyond the realm of our own. The longer Gaia watches the tiny movements of these galaxies across the sky, the more precise our measurements will become." 'The two disc-shaped spiral galaxies are located between 2.5 and 3 million light-years from us'. This distance is close enough such that the time and distance concepts of GR based cosmology appear to agree with DU predictions as discussed in my past PO posts related to Hubble constant. GR concepts fail in the more cosmic time and distance measures of few B years or ly as shown in the 'halfway -distance' of Hubble radius R4/2=6.9B ly. Predicting their values to future by a few billion ly based on GR postulates fails like in today's receival of cosmic SN1a or GW data (resulting in recent Nobel level mistakes). In decelerated expansion, T4=3.25 B dynamic yrs at R4=13.8/2 =6.9 B ly and T4=sqrt(2)^3 times 9.2 =26.0 B yrs at R4=27.6 B ly where the balanced energy levels of motion and gravitation are 2 times and 1/2 of today's value of total mass M in expanding 3-D space at R4/2, R4 and 2R4 distances from DU bounce at T4=0. The average reader knows there is no contender to LCDM cosmology (which is, yes, based on GR - but so have all competitive cosmologies been since GR was discovered). And you cannot appeal to a cosmology that does not exist, has not been published and recognized by peers. Where are the interesting trolls!? With funny comments like "Triangulum really sets the tone in my cosmic choirum" etc. A key to understanding the basic flaw of all GR based cosmologies is Suntola's derivation of the linear dependency of Planck constant and frequency of physical atomic clocks (and other internal atomic processes such as decay rate) on the TRUE value of speed of light C and on the expansion rate C4 in the direction of Riemann 4-radius R4. Einstein did not know 100 yrs ago the QM based foundations of TV, cell phone and other quantum foundations of new technologies including ALD of flat screen TV and early GPS foundations of range sensing and digital photogrammetry. He had hard time to accept QM foundations by ignoring the basic ideas of Planck equation and Mach energy principle. Suntola's unified DU approach since 1995 explained why only the local APPARENT C is constant while the TRUE C=C4 values are decelerating in expanding R4. Take a trip to Helsinki seminar 19 Feb and learn the GPS principle of physical atomic clocks, see www.lfs.fi literature. sorry annoyingmousie but until your pretentious woo salad can produce a device to blow up a city? You have nothing to say about GR or any related subjects, that would possibly be worth the bother to read. well, since you asked so nicely torbjorn. Have you ever heard the one about these two big galaxies? Who walked into a var dragging a dwarf galaxy in their wake? At a wake, the gravity of the situation deserves a few drinks! Huh? Huh? Was it as good for you as it was for me? rrMousie, you can blow up a city without Big Bang in the entire universe where Feynman (worked with atomic bomb) noticed the basic DU law of 'mysterious' energy balance - but Feynman could not resolve the mystery because he could not remove the basic flaw of GR and QM theories about constancy of C in the fashion of Suntola's inventions since 1970's. Have some JD invented youghoord (on the day of Suntola's 1 M euro Millennium Prize or modern day Nobel in technology) and start reading the piles of practical proofs of GR/QM flaws (because of non-constant C) since ancient times as explained in my past posts. You need not understand my advanced theory of array (unified matrix and tensor) algebra to explain the DE or GW epicycles of extended Gaussian estimation theory and 'fast' math solutions needed in future R&D of cosmic surveying sciences in image and range sensing.
" All the clocks described in the vast literature about the theory of relativity before the time (modern atomic clocks since 1970's), and mostly still today, are imaginary clocks, thought-experiments. In those experiments the same clock could display different readings to different observers at the same time. Now we can perform those thought experiments with real clocks, and there cannot be but one reading present at any one time in those clocks. We also have obtained plenty of real-clock data about the propagation times of radio signals in our solar system. We do know what the physical reality of the velocity of light is. " Good GPS explanation based on physical atomic clocks vs geometric geodesy and photogrammetry of pre-GPS range sensing time of D.C. Brown (inventor of SAGA system in 1960-70's) and Meissl. The pre-GPS range and image sensing time of topographic mapping of the Earth 3-D surface was based on the math physics of Gauss/Riemann/Helmert etc. resulting e.g. in Lofstrom-Nenonen 'String/M-theory application' of horizon camera in 1920-30's, a predecessor of modern satellite surveying and navigation systems of your cell phone. The math principle of 'extra dimensions' of Nordstrom and geodetic condition adjustment (Kalman updating) was expanded to array (unified matrix and tensor) calculus of 'fast' tensor or Kronecker products enabling nonlinear least squares solutions with billions of physical modeling parameters, needed in today's and tomorrow's surveying of Suntola's Dynamic Universe model of 4/5-D Euclidean geometry. It has to solve for the huge cosmic projective image transform equations of Hubble, Gaia and JWST sensors and future 4/5-D cosmic GPS. The pre-GPS times of geodetic/photogrammetric range/image sensing since Gauss/Riemann/Helmert of geometric geodesy and Nordstrom pre-GRT theories avoided the math flaws of GR/QM based period of mathematical physics including the string/M-theories of particle physics. The early 'practical solution of Nordstrom extra dimensions of string theory' was solved in the horizon camera principle of Lofstrom and Nenonen in 1930's topographic map making. It helped to save Finland's independence in 1939-1945 Winter and Continuation Wars from super powers of that time. The R&D of institutions lead by Finnish born geodesists and photogrammetrists in US resolved the Nordstrom math problem of condition and String Theory adjustment of 'extra dimensions' in general Theory of estimation (Toe) of loop inverses and array (unified matrix and tensor) calculus - while Suntola DU in physics foundations resolved the unified GR/QM theory of physics foundations since 1970's until recent proofs.